Which Las Vegas roller coaster rides are the most fun ? Good question! 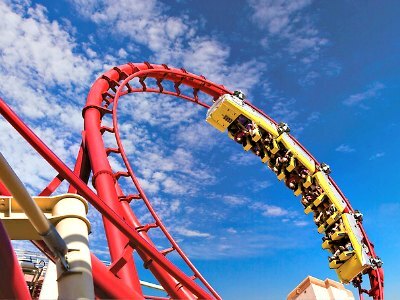 Sin City boasts some of the most unique, adventurous theme parks and thrill rides bound to make any thrill-seeker happy. Here are my reviews of the most exciting roller coasters and theme parks in Vegas, perfect to entertain teens, tweens and adults alike! 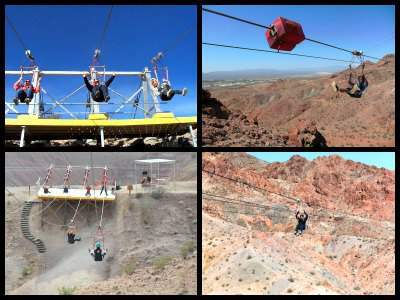 Flightlinez at Bootleg Canyon are thrill-filled zip lines located not far from Vegas. If you have a fear of flying, the amazing instructors at Flightlinez will help you conquer it. Set in the Nevada Desert near to Boulder City, is a series of zip lines that will have you soaring over the Bootleg Canyon. This is unique way to experience the stunning scenery. The trip on this fun Las Vegas roller coaster ride starts with a safety briefing and a drive up the to the Canyon. You then hike the remaining distance to the top. Get strapped into your paragliding harness and fly along the lines. There are four different runs, each one offering a unique experience. Soar along at up to 50 miles per hour and dive on a 450 foot plunge. The views of the desert from the take off platforms are panoramic and get even better when you take the plunge. Once you have conquered your fear of heights, how about soaring across the city on a zip line? The Voodoo Zipline offers this thrilling experience. 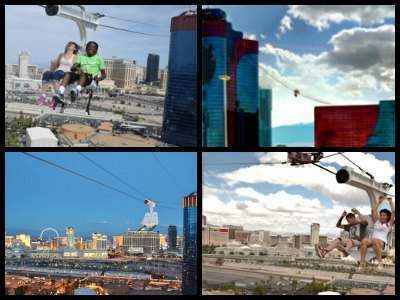 Get strapped into the open air chairs and see the city from 500 feet up in the air. The trip takes off from the Voodoo Lounge and ends at the Ipanema Tower. The ride takes just over one minute and covers over 800 feet. You reach speeds of up to 33 miles per hour as you zip between the two towers. The zipline caters for two riders at a time, so head off with a friend. When you reach the end, you are sent off again, backwards, to the start! For those who prefer to watch, the patio on the 51st floor of the VooDoo Rooftop offers fabulous views of the brave flying by on this cool Las Vegas roller coaster ride. The Skyjump is located at the Stratosphere and is the highest in the world. 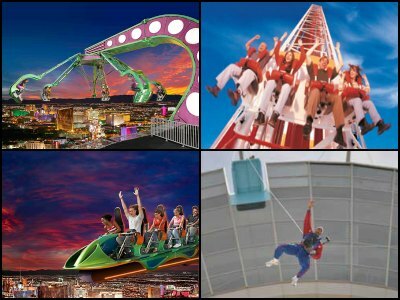 In true Las Vegas style it is designed for extreme thrills and dare devils. If you feel that diving from the 108th floor of the Tower to the ground below is enough to get your adrenaline going, then this is for you. The adventure at this thrilling Las Vegas roller coaster ride starts with a safety lesson after which you climb into your jumpsuit and head to the descender platform. The jump is known as a controlled free-fall during which you will travel at 40 miles per hour as you plunge 855 feet downwards. If you are not screaming too much, take some time to admire the panoramic views of the Las Vegas Strip. Unlike the stomach churning coasters, this ride is fairly smooth and guide wires will keep you on course. The machine slows you down as you approach the ground making your perfect landing look like the expert you are. Want to try skydiving but the thought of jumping out of a plane makes you queasy? 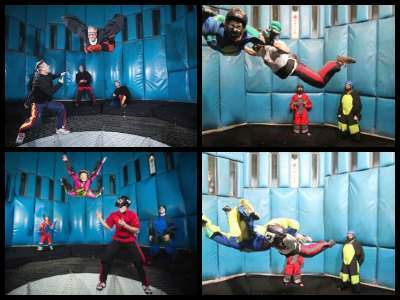 You can try it out at the Indoor Skydiving venue on the Las Vegas Strip. You get the same thrills and effects but are closer to the ground. The experience at this Las Vegas roller coaster ride starts with you dressing up into a flight suit with goggles, a helmet and ear plugs. Your personal instructor will give you a briefing in a special training class. You then enjoy an exhilarating three minutes of free-fall in a wind tunnel while you learn how to whip and turn weightlessly in the air. This fabulous experience is ideal for all ages and all levels of fitness. Groups accommodate only five at a time, so you are assured of personalized attention. 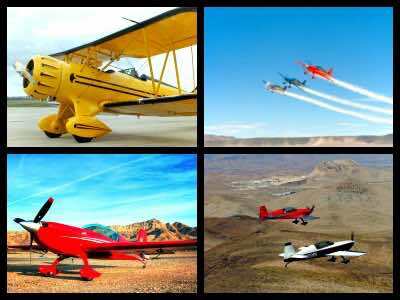 Become the fighter pilot of your dreams at the Sky Combat Race - the most extreme of all Las Vegas roller coaster rides. Step into a real fighter plane with an instructor and blast the enemy away while zooming along at incredible speeds. This is not a computer game or simulation, this is the real deal! First try out the After Burner to find your feet (or head). Your pilot will spin, loop, roll and tumble the Extra 330LC which travels at speeds of up to 253 mph. Then go for the Top Gun. You take the controls, but rest assured that the instructor is close by. This is a 30 minute thrill, pulling up to 8G's with a simulated bomb run. Now that you are a Pro, head for the Sky Combat Experience. Fly the plane yourself with an experienced combat fighter pilot and try to blast your friends in another plane out of the sky. The optical target system will smoke when you hit your opponent, making this totally life-like and designed to create thrilling memories that last a lifetime. Review: Roller Coaster at New York-New York is a popular Las Vegas thrill ride, consisting primarily of one exciting thrill ride. It was formerly known as The Manhattan Express, and is featuring towering drops, loops and stunning views of Las Vegas Strip. It is a perfect place to make pictures as it features a replica of the New York harbor, a model of the Statue of Liberty and several other well known Manhattan buildings. Besides, the trains of the roller coaster have a design similar to that of New York taxicabs. As the thrill ride begins, you go up a high hill, enjoying beautiful views of the Strip. And then, before you know it, you realize that you are falling down from the height of 144 feet! Loops, corkscrews and hills follow one another while the train reaches 67 mph. If you thought you knew all about Las Vegas roller coasters, wait till you try this one. You will experience twists and turns in the directions you never thought of, and the 180-degree spiral will surely stay in your memory for ever. That's why this ride is so popular: over a million of people visit it every year. 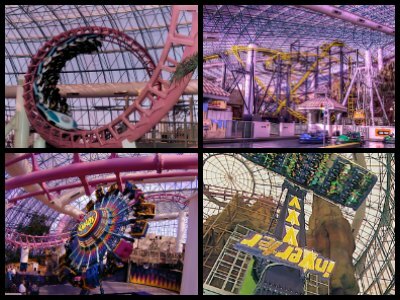 Adventuredome is one of the most spacious indoor amusement parks in the country. Thanks to natural lighting, large spaces and the unique design you really feel as if you were spending time outdoors. It has some of the most popular Las Vegas roller coaster rides including the Canyon Blaster, Inverter and Chaos, to mention just a few. Adventuredome is extremely popular among children because they have a chance to visit different booths and try to win a new toy like Hello Kitty doll or a teddy bear. And grown-ups will surely have a lot of fun picking a personalized T-shirt or having a caricature portrait made. October is a very special month in Adventuredome as it becomes Frightdome featuring haunted houses, ghosts and goblins. You will easily spend a whole day here, so what are you waiting for? Review: Adventure Canyon at Buffalo Bill's is one of the most popular interactive Las Vegas roller coaster rides. Unlike other popular rides, here you don't just get wet, but you can also practice your shooting skills trying to shoot some bad guys during the ride. But beware: those guys may do the same and get you all soaked. If you aren't a big fan of the rides you can still participate in all the fun and shoot water at your friends, using your chance to get back at those who teased you for staying behind like a chicken. Desperado Roller Coaster is one of the coolest Las Vegas amusement parks ever. Desperado at Buffalo Bill's was listed in the Guinness World Record book as one of the tallest roller coasters! And it's definitely one of the fasters thrill rides, too. It starts slow, but as you approach the tunnel near the peak of the ride, its speed reaches almost 90 mph, so the riders experience almost 4 Gs. It's not very smooth riding, but it's definitely a lot of fun. If you are an adventure junky you need to get to the Stratosphere Las Vegas roller coaster rides. Start with the Big Shot which flings you off the Observation Tower from a height of 160 feet, travelling at 45 miles per hour. If you manage to open your eyes, you will have the most spectacular view of the city. Next is Insanity which from far looks like an alien monster. The mechanical arms extend over the edge of the Tower to a distance of 68 feet and swing you around at 3G speeds. The program changes regularly so you will have a different experience each time. 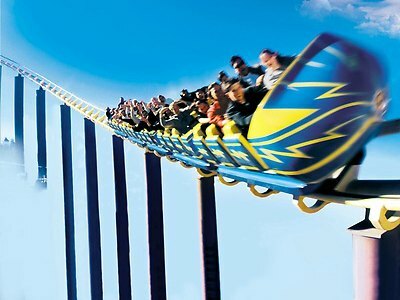 X Scream is the third highest roller coaster ride in the world. It looks much like a conventional coaster with a twist. The ride goes backwards and forwards and finishes off with you being suspended 27 feet over the edge of the building. If you have ever had dreams of being an Astronaut, now is the time to become one at Zero G. The venue offers a host of space experiences ranging from weightlessness to space style food and learning how to do parabolic manoeuvres like a superhero. If weightlessness is not for you, take the tour that teaches you about the pre and post flight orientations that astronauts are subjected too. Dress up in Zero G kit and have your photos taken. Knowledgeable guides will teach you about microgravity, parabolic flight and Newton's Laws. Make sure you frame your certificate when you get back home! 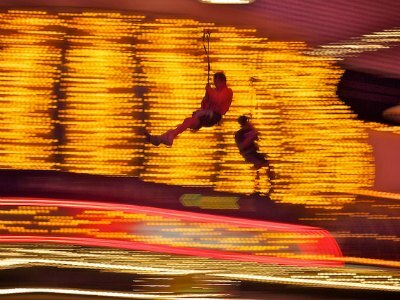 Walking along Fremont Street is great fun, but zipping above it in the air on a zip line must be the ultimate experience. Head for the 12 storey slot machine, you cannot miss it. The zip line is 77 feet high and has a distance of 850 feet. The ride starts at the retail store, where you are given a briefing and then strapped into a harness. Dive off from the second floor platform and zip over the street for breathtaking adventure along the length of the street. Travel reaches speeds of 35 miles per hour until you slow down and brake for your landing at the other end. Watch the pedestrians get smaller and smaller as you soar higher on this cool Las Vegas roller coaster ride. The zipline is even more fabulous at night when all the lights are on. The whole experience from start to end takes about 20 minutes and is one not to be missed. 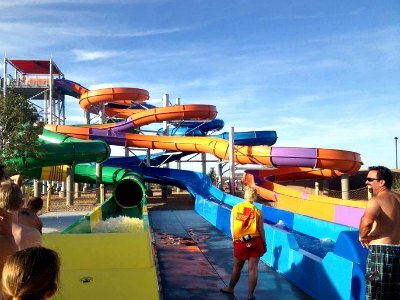 Review: Nevada's largest water park is a perfect place for a family vacation. Featuring more than 25 slides and attractions, it is a very popular place among families and thrill seekers. The Rattler with its unexpected twists and turns is probably the most famous slide in the park, especially well-known among the adrenalin addicts. Some of the other popular Las Vegas roller coaster rides at Wet N Wild are the Hoover Half-Pipe, the Royal Flush Extreme, the Wave Pool, and the Splash Island. The latter features a variety of slides and an enormous bucket spilling 300 US gallons of water onto the park guests.